Dragon Challenge. This was the world's only Dueling Steel-Inverted roller coaster until it was demolished in 2017. 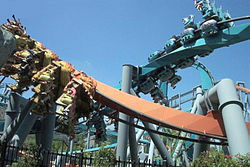 It was located at Islands of Adventure in Universal Orlando Resort, Orlando, Florida. Arrow Dynamics first introduced the steel roller coaster to feature tubular track to the thrill industry with their creations of the Matterhorn Bobsleds (Disneyland) in 1959 and the Runaway Mine Train (Six Flags Over Texas) in 1966. As of 2006, the oldest operating steel roller coaster in North America is Little Dipper at Memphis Kiddie Park in Brooklyn, Ohio and has been operating since April 1952. The oldest operating steel rollercoaster in the world is Montaña Suiza at Parque de Atracciones Monte Igueldo (Spain). It has been operating since 1928. The fact that fewer supports are needed means steel roller coasters have made a large variety of features possible, such as loops, barrel rolls, corkscrews, zero-G rolls and beyond 90° drops. There are different types of steel coasters, such as flying, inverted, floorless, and suspended. Blue Fire, an inverting launched roller coaster, at Europa-Park, Germany. The Smiler an Infinity Coaster holding the inversion record at Alton Towers. Runaway Mine Train at Six Flags Over Texas – first mine train roller coaster, built in 1969. Wonder Woman Golden Lasso Coaster at Six Flags Fiesta Texas – world's first steel monorail roller coaster. ^ Marden, Duane. "Steel Force (Dorney Park & Wildwater Kingdom)". Roller Coaster DataBase. Retrieved 10 July 2008. ^ Marden, Duane. "Record Holders (Tallest Inverted Coasters)". Roller Coaster DataBase. Retrieved 27 June 2011. ^ Marden, Duane. "Wicked Twister (Cedar Point)". Roller Coaster DataBase. Retrieved 27 June 2011. ^ Marden, Duane. "Roller Coaster Search Results (Inverted Roller Coasters)". Roller Coaster DataBase. Retrieved 27 June 2011. ^ a b c d e Marden, Duane. "Record Holders (Tallest Steel Coasters)". Roller Coaster DataBase. Retrieved 27 June 2011. ^ a b Marden, Duane. "Record Holders (Fastest Steel Coasters)". Roller Coaster DataBase. Retrieved 27 June 2011. ^ Hartmann, Adam C. (14 August 2005). "Soaring attraction - Amusement parks gain popularity". The Press-Enterprise. Retrieved 27 June 2011. ^ Marden, Duane. "Tower of Terror II (Dreamworld)". Roller Coaster DataBase. Retrieved 27 June 2011. ^ Marden, Duane. "Record Holders (Fastest Suspended Coasters)". Roller Coaster DataBase. Retrieved 27 June 2011. ^ Marden, Duane. "Record Holders (Tallest Stand-Up Coasters)". Roller Coaster DataBase. Retrieved 27 June 2011. ^ Marden, Duane. "Record Holders (Fastest Stand-Up Coasters)". Roller Coaster DataBase. Retrieved 27 June 2011. ^ Marden, Duane. "Record Holders (Longest Stand-Up Coasters)". Roller Coaster DataBase. ^ Marden, Duane. "Roller Coaster Search Results (Mine Train roller coasters)". Roller Coaster DataBase. Retrieved 27 June 2011. ^ Marden, Duane. "Record Holders (Inversions)". Roller Coaster DataBase. Retrieved 27 June 2011. ^ Tweedy, Joanna (17 June 2011). "Don't look down! Japanese theme park set to take the title of 'world's steepest rollercoaster' from UK's Flamingoland". Daily Mail. Retrieved 13 July 2011. ^ Fuji-Q Highland (11 May 2011). "Guinness Record Pending Steepest Drop At 121° – A New Roller Coaster" (PDF). Press Release. Japan National Tourism Organisation. Retrieved 14 July 2011. ^ "Takabisha, World's Steepest Rollercoaster, To Open In Japan (VIDEO)". Huffington Post. 17 June 2011. Retrieved 13 July 2011. ^ "World's steepest roller-coaster opens in Japan". The Telegraph. 8 July 2011. Retrieved 13 July 2011. ^ Marden, Duane. "Record Holders (Tallest Flying Coasters)". Roller Coaster DataBase. Retrieved 27 June 2011. ^ Marden, Duane. "Record Holders (Fastest Flying Coasters)". Roller Coaster DataBase. Retrieved 27 June 2011. ^ Marden, Duane. "Record Holders (Longest Flying Coasters)". Roller Coaster DataBase. Retrieved 27 June 2011. ^ Marden, Duane. "Superman: Escape from Krypton (Six Flags Magic Mountain)". Roller Coaster DataBase. Retrieved 27 June 2011. ^ Levine, Arthur (1 May 2018). "Exclusive: Six Flags Fiesta Texas' Wonder Woman coaster review". USA TODAY. USA TODAY, a division of Gannett Satellite Information Network, LLC. Archived from the original on 27 August 2018. Retrieved 1 September 2018. ^ Marden, Duane. "Roller Coaster Search Results (4th Dimension Roller Coasters)". Roller Coaster DataBase. Retrieved 27 June 2011. ^ Marden, Duane. "Roller Coaster Search Results (Accelerator Coasters)". Roller Coaster DataBase. Retrieved 27 June 2011.